Microsoft loves developers. That’s why, maintaining platforms (Desktop Windows, Windows Mobile but also MSN and many others), they need developers to augment value of it. As Professor Valor explained us last year during IME’s Advanced Digital Strategies program (which is the start of this DiCoDE initiative), pampering complementors, giving them tools to innovate, engaging them and allowing them to be profitable is key for the success of your platform. 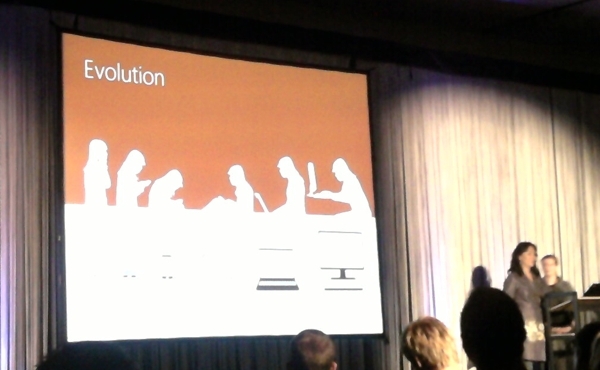 That’s the reason why Microsoft invites every year developers (and now also designers) to a big event: REMIX. I attended the Belgian edition this year. Beside having had the possibility to listen and meet Georg Petschnigg from Microsoft Pioneer Studios, I was interested into the overall Microsoft speech and hearing more about Windows Phone 7. I attended a speech from Kat Holmes and Karen Davis of Microsoft recently created design team about Metro UI that was very interesting. Not only they bind in a very smart and user centric way apps and OS, they build a smart dashboard that position other OS (including Android and iOS) as app launchers and they provide a very clean and with personality UI (which does finally prove Steve Jobs wrong), but they also grasp evolution of users, both mobile and fixed. The picture is not very clear, but I like how they show desktop PC user and mobile phone user getting closer to the device, closer to the eyes, closer to the senses, closer to the heart. That’s what I call Experience in RiCoDE. This entry was posted in DiCoDE inspiration and tagged a glimpse ahead, Android, app, Belgium, dashboard, design, DiCoDE, DiCoDE future, Georg Petschnigg, IME, iOS, Karen Davis, Kat Holmes, Kinect, Metro, Microsoft, mobile, NUI, OS, Pioneer Studios, platf, platform, platform utility, REMIX, RiCoDE, smart dashboard, smartphone, Steve Jobs, Touch, UI, user interface, user XP, vocal activation, WP7. Bookmark the permalink. what a vision! it’s great to envision and embrace a future that’s digitally and technologically driven yet remaining human-centered, and where innovation is powered by passion more than just profit or competition. Great article, thanks for submitting this!